On April 6th ,2019, The Cupcake Classic Race Series is hosting it’s Annual Spring into Sprinkles Fun Run, a portion of the proceeds from the race will go to Second Chance Animal Rescue Society. 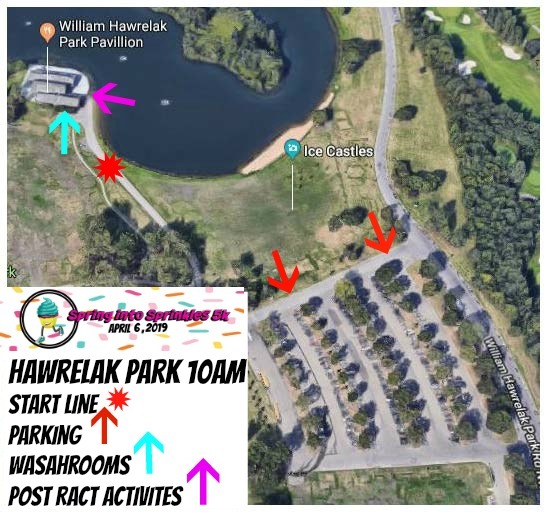 This family oriented event will take participants on a route around Edmonton’s beautiful Hawreluk Park. Every participant is awarded a cupcake at the finish line! This looks awesome!!! Is there any additional perks for signing up early? The first 250 registrants will receive an awesome custom spring for sprinkles buff! Absolutely! We encourage parents with young children to bring them! And there will be plenty of parking available on-site, so it will be easy to unload and walk to the start/finish line. Is this a pet friendly run? Do we have to pay $40 registration for the kids also? can 8 year olds use a scooter? I would like my son to have a finishers medal so do I put us as a team to register or sign up separately to pay for him. We have lots of finisher medals so your son can run for free and still get a medal. I would like to have a t-shirt for him if I put us as a team do I have to pledge donations. Or should I pay separately. If you sign up as a team you don’t have to pledge a donation. A portion of the proceeds from the race will go towards establishing a Girls on the Run Council in Edmonton. Has the shirt design or finishers medal been revealed yet?! I just updated the page with images of both. Hope to see you at the race. Is the last day of registration today? Will the run start at 9 or 10? Yes, Yesterday was the last day to register online. You can still register at package pick up. The run starts at 10am. What does the add on child pack include? Includes t-shirt, finishers medal, and post race cupcake. This option is only valid for children 6 and under. Children 6 and under can also run for free but will not receive any of the items mentioned above. My daughter is only 2 but I would love to take her to this (without a stroller) as she loves to go on runs with me, do I have to register her and pay for her or just myself? Children 6 and under run for free! You do not have to register her, but she would not receive a shirt or a cupcake. If you would like to buy an additional cupcake for her you can do so by purchasing a cupcake ticket for 5 dollars when you register. Hope to see you and your daughter at the race! There is not cut off time, Spring into Sprinkles is a fun run also there is no pressure to complete by a certain time. How much are last minute tickets if I go pick one up tonight? ?